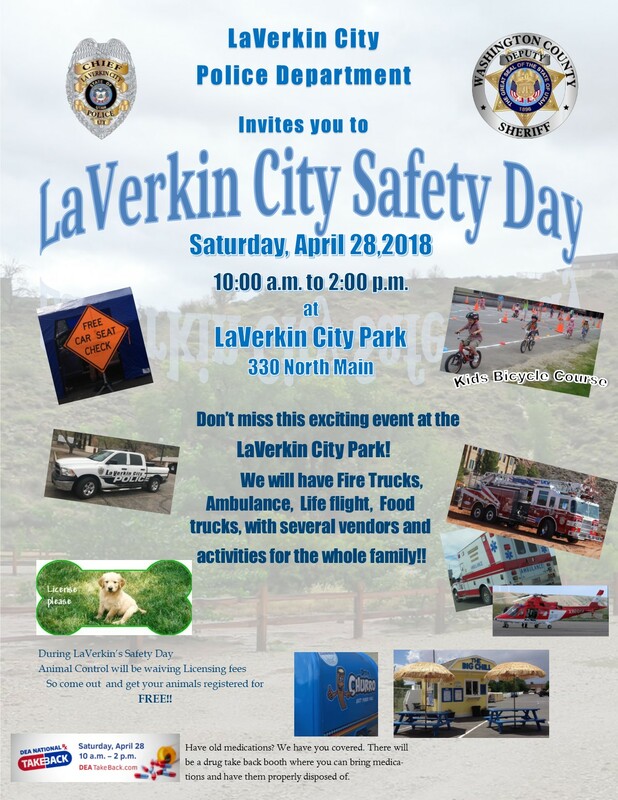 LAVERKIN — The LaVerkin City Police Department has invited the public to the city’s “Safety Day” event Saturday from 10 a.m. to 2 p.m. at the LaVerkin City Park, 330 N. Main St., LaVerkin. The LaVerkin City Police Department, Washington County Sheriff’s Office and Hurricane Valley Fire and Rescue will be on site to meet with members of the community and provide helpful tips and safety information to the public. This year’s safety day will include a kids bike course where the youth will be moving through different stations and learning helmet usage, bicycle handling and control, the importance of being seen by motorists and basic safety strategies. Parents can enjoy the fun of a family outing as well as bring their car seats to a car seat checkpoint where personnel will inspect each safety seat to make sure it fits the child properly and is correctly installed and identify the safest possible location for the seat placement in the vehicle. During the event there will be a drug takeback booth where people can bring their expired medication for proper disposal. LaVerkin City Animal Control staff will also be on-site providing animal licensing for LaVerkin residents’ pets; during the safety day event only, Animal Control will waive all animal licensing fees. This event will have food trucks and several vendors from the area as well as activities for the whole family. What: LaVerkin City Safety Day. When: Saturday, April 28 from 10 a.m. – 2 p.m.
Where: LaVerkin City Park, 330 N. Main Street, LaVerkin.